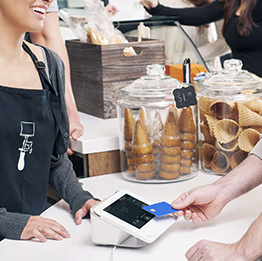 Clover® replaces your cash register, payment terminal, receipt printer, and barcode scanner with an integrated suite of products. Accept credit cards, EMV, and Apple Pay. Get to know your business and your customers better with reports you can run at work or from home and applications that streamline your workload. We've developed a three-step process to make set up as fast and convenient as possible. We will make sure your equipment is set up properly and train your business staff on how to use the point of sale equipment/system and/or ATM. More information, call (503) 384-0131. The first step is to call us at 1-877-883-0131 (toll free) or fill out the Online Request Form. A sales representative will answer your call or reply to give you the right solution for your business. Once we have determined the right solution, we will send you an application and guide you through the steps of filling it out. We will then process the application and notify you upon approval. The third and last step in this easy process will be for one of our trained installation staff to call you and set up your POS equipment/POS system and/or ATM so you can start processing with us.